One of Alaska’s most accessible glaciers and most popular attractions, Portage Glacier is the crown jewel in a valley studded with alpine glaciers. The Portage Valley was literally shaped by glaciers and today is a perfect spot for exploring. Ten stories tall and miles long, Portage Glacier sits at the far end of a lake, and is accessible by boat. The mv Ptarmigan cruises Portage Lake multiple times daily throughout summer on one-hour tours to the face of this icy wonder. Aboard the ship, Forest Service Ranger’s share the story of Portage Valley’s geology, wildlife, and history as a connection point between Prince William Sound and Turnagain Arm. Portage may be the main attraction on the cruise, but Burns and Shakespeare glaciers hang nearby as well. More glaciers await back on land. The nearby Begich Boggs Visitor Center, run by the National Forest Service, offers an overview of the area’s glaciers and geology, and is also a prime starting point for walks and hikes. The Trail of Blue Ice is a 5-mile trail of wide gravel paths and boardwalks connecting many of the nearby glaciers and campgrounds for hikers and bikers. It’s also a great trail for salmon viewing. 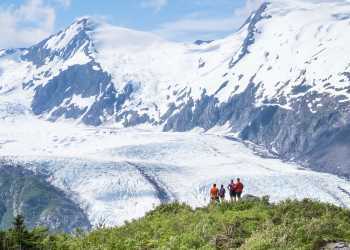 The nearby Byron Glacier Trail travels less than a mile from the trailhead to toe of the glacier, and Forest Service rangers from the visitor center lead a popular hike during summer. Portage Valley pairs nicely with several attractions within a few minutes’ drive. The Alaska Wildlife Conservation Center is a few miles north on the Seward Highway and is home to bears, moose, musk oxen and other Alaska animals. The town of Whittier, renowned for glacier and wildlife day cruises, kayaking and deep water fishing stands a few miles beyond Portage on the other end of the Anton Anderson Memorial Tunnel. Another view of Portage Glacier is waiting on the Whittier side. The trip up the 3-mile Portage Pass Trail gives hikers a great view of the glacier from the summit and lakeside. Many day tour companies include Portage in trips beginning in Anchorage, and visiting Girdwood and the glacier. Gray Line operates the Ptarmigan and also offers packages with transportation to and from Portage Lake. Short on time? Many Anchorage flightseeing tours fly past Portage Glacier on trips into Prince William Sound.